It’s official that we now have a hung parliament. I’m still not sure if that’s a good or bad thing, or even completely sure what it means, the only certainty is that we still don’t know what’s going on, and it may well be a while. Here’s a look back at some key, and interesting, events in the run up to polling day. 6 April 2010 – The Queen agrees to the dissolution of parliament. Brown announces there is to be a general election on May 6 2010. The race begins. 8 April 2010 – Both Labour and Tory accused of infringing copyright by using a picture from Ashes to Ashes on their campaign posters. 9 April 2010 – Labour candidate Stuart McLennan forced to stand down after posting offensive comments on Twitter. 12 April 2010 – Labour launch their manifesto. Jeremy Paxman interviewed Nick Clegg (so far, unsuprisingly, neither Brown or Cameron agreed to be interviewed by Paxman). This is when my personal interest in Clegg and Liberal Democrats began, after being impressed with his ability to give somewhat straight answers under Paxman’s interrogation – an ability that politicians usually lack. 13 April 2010 – Conservative and Liberal Democrats launch their manifestos. Richard Hughes of Keane was unimpressed with the Tories playing their song at the launch. 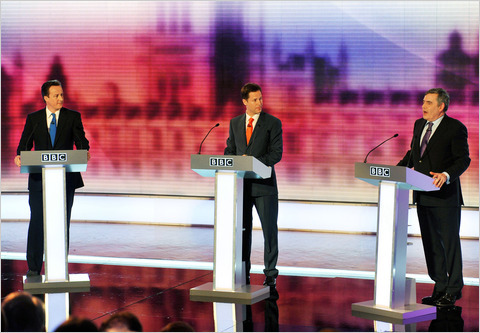 15 April 2010 – The first leader’s debate makes history as the first time UK party leaders have gone head to head in front of a television audience. It was this debate that saw the beginning of ‘Cleggmania’ – various opinion polls showed that Clegg ‘won’ the debate. ‘I agree with Nick’ (#iagreewithnick) became a popular phrase after both Cameron and Brown’s use of the phrase. 21 April 2010 – David Cameron gets an egg thrown at him by a 16-year-old in Cornwall. The yolk unfortunately stained his fresh shirt. 22 April 2010 – The people of Twitter decided to blame pretty much everything on Nick Clegg, adopting the hashtag #nickcleggsfault. This fights back at newspaper bias of stories in the Daily Mail, Telegraph, Express and the Sun. The second leaders’ television debate. 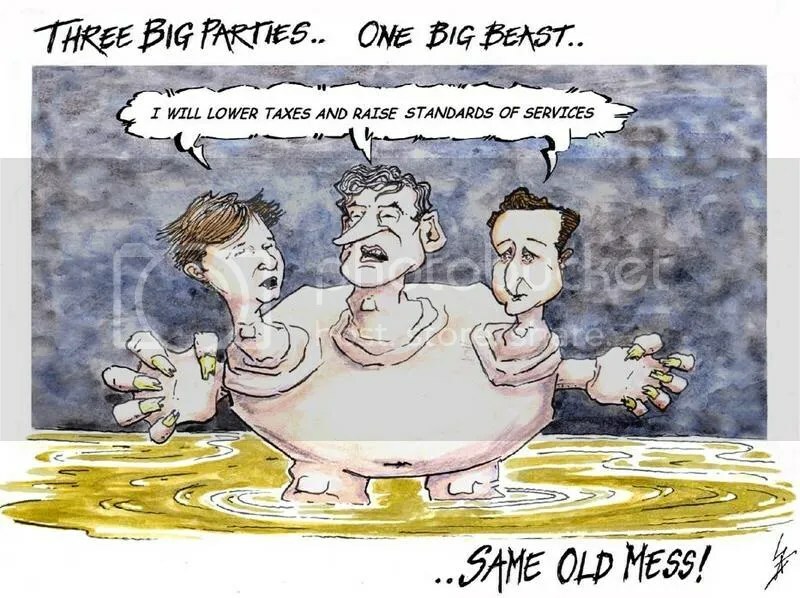 Brown and Cameron didn’t agree with Clegg as much – perhaps recognising him as a slight threat now. Marmite threatened to take legal action when the product is shown in a BNP broadcast. 23 April 2010 – Jeremy Paxman interviews David Cameron. Cameron states he wouldn’t join forces with Clegg in the event of a hung parliament. 27 April 2010 – Conservative candidate Philip Lardner is suspended after claiming on his website that homosexuality is ‘not normal behaviour’. 28 April 2010 – ‘BigotGate’, or ‘Gordon’s Gaffe’. The press goes crazy after a microphone was left on and recorded Brown in his car calling a bigotted woman, well, a bigot. He is later followed by a crowd of reporters to her house to apologise. 29 April 2010 – The third leaders’ debate in which, according to opinion polls, David Cameron seemed to be the favourite. 30 April 2010 – Controversially, the Guardian announces it back the Liberal Democrats. It differs, at least, from Murdoch’s famous Tory-backing empire, but again raising the issue as to whether or not newspapers should be impartial. 2 May 2010 – Another homophobic strike for Conservative when it comes out that Tory MP Philipa Stroud ran prayer sessions to ‘cure’ gay people. 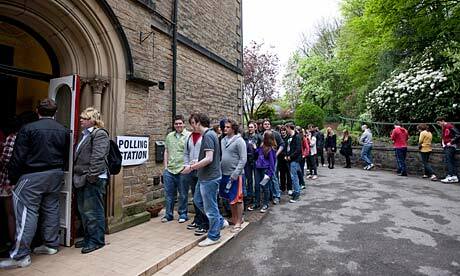 6 May 2010 – Polling day – the talk of the night being that thousands of people across the country were turned away at 10pm and not allowed to vote – even after some had been queueing since 7pm. 7 May 2010 – Results show that there is officially a hung parliament. The wait begins! Posted in General Elections 2010, politics, Uni and tagged #iagreewithnick, #nickcleggsfault, Alternative Election Night, Ashes to Ashes, bias, bigot, bigotgate, BNP, Brown, Cameron, campaign, Channel 4, Clegg, Cleggmania, con-lib, Conservative, Conservative party, constituency, copyright, Daily Express, Daily Mail, David Cameron, election, elections, Facebook, general elections 2010, Gordon Brown, Gordon's gaffe, Guardian, hastag, homophobia, hung parliament, I agree with Nick, Jeremy Paxman, Keane, lab-lib, Labour, Labour party, leader's debate, Lib Dems, lib-lab, Liberal Democrats, manifesto, Manish Sood, marmite, May 6, May 6 2010, MP, Mrs Duffy, Murdoch, newspaper bias, Nick Clegg, parliament, Paxman, Philip Lardner, Philipa Stroud, policies, policy, poll, polling, Queen, Richard Hughes, Rupert Murdoch, Stuart McLennan, Sun, Sunday Telegraph, Telegraph, Tories, Tory, Torygraph, twitter, vote, voting. Bookmark the permalink.